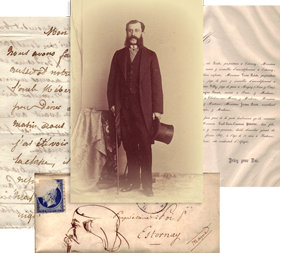 The Esternay project is an authentic—though virtual—historical archive of nineteenth-century letters. It contains a massive correspondence associated with a single family in the rural town of Esternay, France (about 100 km from Paris). Because "big event" history often intersects with everyday life, the archive provides insights not only into provincial France, but also political events in Paris, and even French colonial exploits. It includes letters by men, women and children; letters of patronage to local dignitaries; professional correspondence from the notarial office associated with the family; and personal missives of every form imaginable. High quality scans of the original documents, reproducing the archival records in all their richness and illegibility. This crucial component offers users the "messiness" of archives (such as the challenges of nineteenth-century handwriting), while also providing access to rich non-verbal information. Transcriptions of the letters in French, including the original cross-outs and misspellings. Transcriptions make the entire content of the letters available to the Esternay search engine, for full-text searching. Translations of many of the letters into English, thereby providing access for non-Francophone scholars. Tagging of the letters, including postmark dates, names of correspondents, themes, and more -- allowing for powerful, delimited searching. We hope teachers, students, and researchers will use the archive extensively, and we are especially keen to find student or professional collaborators interested in participating in the further development of the site. The Esternay Project is open to all users, academic and non-academic. The archive contains thousands of documents, including over 1200 letters (many of them transcribed and translated) spanning nearly a century. As in many archives, other documents are less rigorously categorized, and much can be learned through browsing. For information about the background of the project, see About the project. If you'd like to cut to the chase, go directly to Search the Archive. Enjoy this resource, and please let us know how you have used it!